a portrait and a song. seems to be an apt moment to share these artistic expressions. 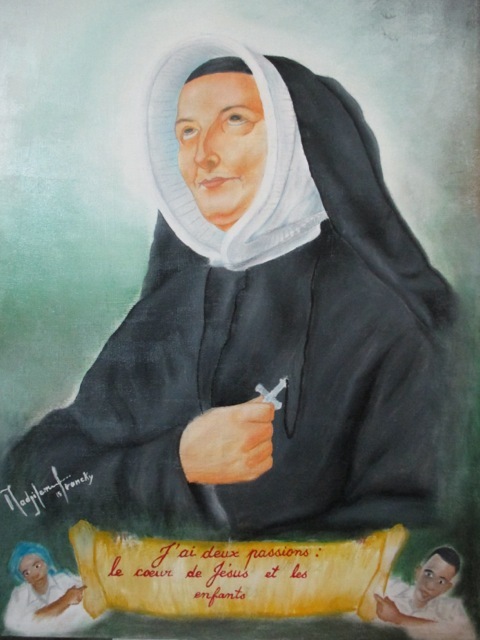 Marie Gisèle Tram rscj (TCH) sent a photo of a portrait of St. Madeleine Sophie Barat done by one of our students in Tchad. "I would like to send this to the whole Society via our international website. It was a wonderful gift for us.... "
"I have two passions: the heart of Jesus, and the children." The young artist's name is Madjilem Francky and he is in Form 8. Here is a song composed and sung by Cecilia Rivero Borrell rscj (MEX). This is a prayer to Jesus, who loved us to the very end.... whose Pierced Heart is "mystery of love and pain, a saving offering." Click on the audio bar below (CORAZÓN TRASPASADO.mp3) to listen to the song. Please join us in thanking God for the charism and mission of the Society of the Sacred Heart. and pray for PEACE in our wounded world.